Sealaska Heritage Institute (SHI) has begun to distribute copies of its most recent children’s books region wide to libraries, schools and Head Start programs in Southeast Alaska. The books are part of SHI’s award-winning Baby Raven Reads program and feature Alaska Native stories and illustrations for children up to age five. Few children’s books exist that reflect the Southeast Alaska Native worldview, so this is significant, said SHI President Rosita Worl. “It is so important for our children to see themselves and their cultures accurately reflected in educational materials in school because research has shown that it has a positive effect on their academic achievement,” Worl said. “We were able to attract some very talented, top-notch Alaska Native writers and illustrators, and we are thrilled to share these with all of the children of the region,” Worl said. SHI is distributing the books to 20 libraries, 38 schools and 16 Head Start programs in partner communities in Southeast Alaska. 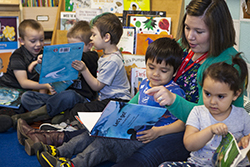 SHI this week announced it was expanding Baby Raven Reads to nine other communities in Southeast Alaska in partnership with the Central Council of Tlingit and Haida Indian Tribes of Alaska (CCTHITA) Head Start program. SHI will produce nine additional books in the next three years, which also will be shared region wide and given to families enrolled in the program. People who are not enrolled in the program also may acquire the books online and at the Sealaska Heritage Store in Juneau. Baby Raven Reads is based on ample research that has shown the effectiveness of using culturally-based teaching resources and methods to improve academic achievement in Indigenous students. Research also indicates that children who are fluent readers by the end of third grade are likely to do well in school and go on to higher education. Students’ scores in reading are consistently associated with academic grades and economic success later in life. Baby Raven Reads was one of 15 in the world chosen by the Library of Congress for its 2017 Best Practice Honoree award. Raven Reading—A Culturally Responsive Kindergarten Readiness Program is funded by an Alaska Native Education Program grant from the U.S. Department of Education— CFDA # 84.356A, PR# S356A140060. The Woman Carried Away by Killer Whales—When a woman is carried off by killer whales, her husband embarks on a journey to get her back. Aided by friends he meets along the way, the man follows her trail across the bottom of the sea to the Killer Whale House. Find out what happens to Nanasimgit and K’uljáad in this ancient Haida story. Illustrated by Haida artist Janine Gibbons of Petersburg, Alaska. The Woman Who Married the Bear—In this ancient Tlingit story, a woman who has insulted the bears while out berry picking meets a bear in human form. They fall in love and get married. Soon, the woman’s brothers come looking for her and the woman learns her husband is not what he appears to be. Text adapted by Tlingit writer Frank Henry Kaash Kataase of Juneau. Illustrated by Haida artist Janine Gibbons of Petersburg, Alaska. Let's Go! A Harvest Story—Let’s Go! is a children's story that teaches about subsistence harvesting activities of the Tlingit, Haida and Tsimshian of Southeast Alaska. The story is by local Juneau author Hannah Lindoff and illustrated by Tlingit artist Michaela Goade, also of Juneau. Picking Berries—This book teaches children the English and Tlingit words for berries of Southeast Alaska. The story was written by local Juneau author Hannah Lindoff and illustrated by Tsimshian artist David Lang, also of Juneau. Native Values: Living in Harmony—This book explores the four core cultural values of the Tlingit, Haida and Tsimshian of Southeast Alaska. Written by Tlingit Anthropologist and President of Sealaska Heritage Institute Rosita Worl, Ph.D.
Salmon Boy: Shanyáak'utlaax—In this ancient story, children learn about respect for nature, animals and culture. It comes from a Tlingit story that was edited by Johnny Marks, Hans Chester, David Katzeek, and Nora and Richard Dauenhauer. Illustrated by Tlingit artist Michaela Goade of Juneau. 10 Sitka Herring—Learn to count by tracing the fate of a herring school from 10 to one fish as they encounter Southeast Alaska predators! Herring and herring eggs are a traditional and important food in Southeast Alaska. Written by Tlingit educator Pauline Duncan of Angoon and Sitka, Alaska. Illustrated by Tsimshian artist David Lang of Juneau. Board book. Tlingit Baby Eagle—In Southeast Alaska, the Tlingit and Haida are divided into Raven and Eagle groups. Learn about the beings and creatures that belong to the Eagle clans! Eagle clan illustrations by Tlingit/Athabascan artist Crystal Worl of Juneau. Environmental illustrations by Nobu Koch, also of Juneau. Board book. Tlingit Baby Raven—In Southeast Alaska, the Tlingit and Haida are divided into Raven and Eagle groups. Learn about the beings and creatures that belong to the Raven clans! Raven clan illustrations by Tlingit/Athabascan artist Crystal Worl of Juneau. Environmental illustrations by Nobu Koch, also of Juneau. Board book. ​Haida Baby Eagle—In Southeast Alaska, the Tlingit and Haida are divided into Raven and Eagle groups. Haida Baby Eagle teaches the English and X̱aad Kíl (Haida language) words for Eagle clan crests. The clan crests were illustrated by Tlingit/Athabascan artist Crystal Worl of Juneau, and the Southeast Alaska environmental illustrations were made by Nobu Koch, also of Juneau. Haida language specialist Benjamin Young of Hydaburg, Alaska, edited the X̱aad Kíl words. ​Haida Baby Raven—In Southeast Alaska, the Tlingit and Haida are divided into Raven and Eagle groups. Haida Baby Raven teaches the English and X̱aad Kíl (Haida language) words for Raven clan crests. The clan crests were illustrated by Tlingit/Athabascan artist Crystal Worl of Juneau, and the Southeast Alaska environmental illustrations were made by Nobu Koch, also of Juneau. Haida language specialist Benjamin Young of Hydaburg, Alaska, edited the X̱aad Kíl words. Origins of Rivers and Streams: A Raven Story—This book is derived from an ancient creation story that has been passed from generation to generation for thousands of years. Adapted from oral histories by Tlingit educator Pauline Duncan of Angoon and Sitka, Alaska, and illustrated by Lindsay Carron. Raven and the Box of Daylight—This book is derived from an ancient creation story that has been passed from generation to generation for thousands of years. Adapted from oral histories by Tlingit educator Pauline Duncan of Angoon and Sitka, Alaska, and illustrated by Lindsay Carron. Raven Brings Us Fire—This book is derived from an ancient creation story that has been passed from generation to generation for thousands of years. Adapted from oral histories by Tlingit educator Pauline Duncan of Angoon and Sitka, Alaska, and illustrated by Lindsay Carron. Colors—This book teaches the Lingít words for colors through comparisons to animals, plants and natural objects found in Southeast Alaska. The Lingít words were compiled by Yarrow Vaara of Juneau and the book was illustrated by Tsimshian artist David Lang of Juneau. ​Tlingit Alphabet—This is a two-book set edited by Katrina Hotch, Linda Belarde and Keri Eggleston, reviewed by traditional scholar Dr. Walter Soboleff and illustrated by Tlingit/Athabascan artist Crystal Worl of Juneau. Caption—Teacher Kayla Tripp reads one of SHI’s new Baby Raven Reads books to students at the Tlingit & Haida’s Taashuka classroom at the William Demmert Head Start Center.